I always like to examine artists who are not written about in a major way in art historical publications (maybe because I’m a painter who will NEVER be written about in ANY art history textbook). Many, many times one will discover a brilliant artist whose work is absolutely fantastic, but who never achieved the notoriety of someone like Winslow Homer or John Singer Sargent. Yes! I’m talking American art! For some reason, American art is often treated as the cousin thrice-removed from Western Art in many art history textbooks, almost like an afterthought, until, of course, we arrive at Abstract Expressionism. This is odd, because the history of American art reflects a consistent influence, naturally, of European art -- especially art from Britain. British influence waned after the Arts and Crafts Movement (flourished c1890-1920 in the US, also known as the Craftsman Movement). The Pre-Raphaelite movement began in Britain around 1848 and became influential in American art in the 1860s. Realism was a major style in European art starting in the 1840s. It was a reaction to stuffy, academic Neoclassicism and the ridiculous exoticism of Romanticism, both movements of the first four decades of the nineteenth century. Interestingly, these two movements mirrored trends in art that occurred after the Renaissance, during the Baroque period (c1600-1750). It was exactly these “perversions” of Renaissance art – namely art after the High Renaissance and the time of Raphael (1483-1520) – to which the Pre-Raphaelites were reacting. The Pre-Raphaelite Brotherhood was a group of painters who formed around 1848 in Britain, determined to restore art to the abundant detail, bright color and intense naturalism of Renaissance art. They were influenced by the writings of John Ruskin (1819-1900), a British art critic who advised artists to emphasize the truth in nature rather than idealized or romanticized realism. John William Hill, born in London, immigrated to the US with his family as a child, and spent most of his life in West Nyack, NY. He was apprenticed to his father, an engraver, at the age of 10. In 1833 he was elected to the National Academy of Design. Early in his artistic career he worked as a topographical artist for the state of New York, producing watercolors of American cities. Personally he produced many landscapes. In 1855 he read Ruskin’s Modern Art (1843) and came under the spell of Pre-Raphaelite thinking about producing art directly from nature. His subsequent turn to close-up views of nature represents his mature style. He painted most often in watercolor, using tiny brushes usually used in miniature painting, in order to achieve details from direct observation. By 1870, American Pre-Raphaelite art (also called Realist or Naturist) had waned in public popularity, although artists like Hill continued to pursue Ruskin’s advice that “if you can paint a leaf you can paint the world.” Hill’s son, John Henry, continued to paint in his father’s style in the watercolor medium. 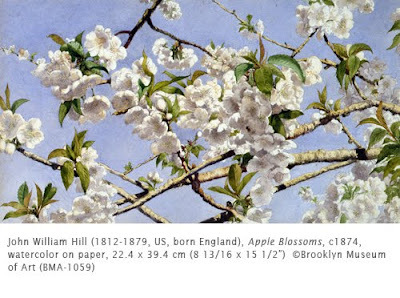 John William Hill was one of the founders of the American Watercolor Society. The Brooklyn Museum of Art has a fine collection of American Pre-Raphaelite works.